This dual view microscopy system features a fully coated optical system with a tube length of 160mm. The binocular heads are inclined at 45°, with a 55-75mm interpupilary distance range. Two pair of W.F 10x eyepieces (18mm field of view) is included. The nosepiece is quadruple with positive click mechanism and built in stop to prevent damage to the slides. DIN Achromatic 4x, 10x, 40x and 100x objectives (40x, and 100x are retractable) are standard and parfocal. A double layered mechanical stage is supplied with a moving range of 70 x 50mm. The Abbe condenser has a NA of 1.25 with iris diaphragm, filter holder and blue filter, control of this mechanism is by rack & pinion adjustment. Focusing is achieved with a precise low positioned coaxial mechanism with 30mm division of focus and adjustment to 0.002mm. The power supply is 110 volt, CE approved, with a 6V 20W variable halogen illumination system that has a detachable cord. This system is ideal for the classroom or university uses. 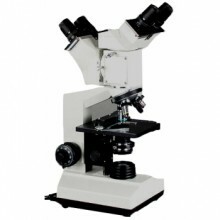 Click the button below to add the Steindorff® S1100 Dual View Teaching Microscope to your wish list.